Blowout Sale! 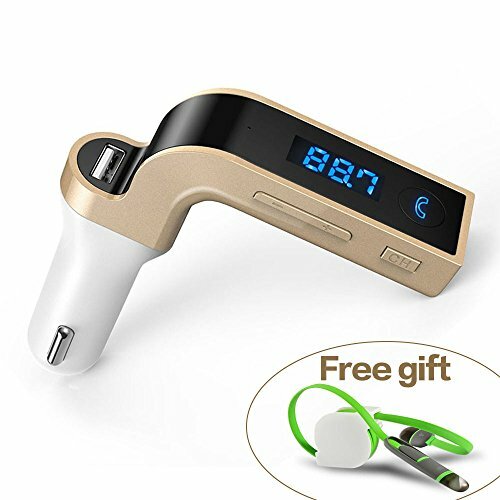 Save 52% on the Cectdigi Wireless Bluetooth FM Transmitter for car,L Design In-Car FM Radio Adapter Car Kit with USB Charging for smartphone (Gold) by Cectdigi at All Company Mobiles. MPN: 43237-2. Hurry! Limited time offer. Offer valid only while supplies last. Thank you so much for your support to Cectdigi! We promise,the best purchase experience and the best customer service will be given to you. View More In Car Kits. Thank you so much for your support to Cectdigi! We promise,the best purchase experience and the best customer service will be given to you. ★MORE BRILLIANT: The L-Design Bluetooth FM Transmitter combined car-used USB charger,wireless car-used phone speaker and FM radio transmitter for car.It is a great brilliant product for car drivers,business man or elder people. ★MORE COMPATIBLE: The L-Design Bluetooth FM Transmitter is suitable for all types of vehicle.You can easily charge with IPhone,Samsung,Google Nexus,Apple Watch,GPS,tablets or other different electronic devices. ★MORE CONVENIENT: The L-Design Bluetooth FM Transmitter can transfer the calling to a speaker mode through our product,without holding you phone in hands.You can totally make a phone call and drive your car safely in the same time. ★MORE SAFELY: The L-Design Bluetooth FM Transmitter allows you to play music from your devices during charging.It equips a safe output that it will never damage your devices. ★MORE ENJOYABLE: The L-Design Bluetooth FM Transmitter is designed with built-in microphone with echo cancelling and noise suppression technology,which can provide a good quality of Hi-Fi sound and a best performance for music. If you have any questions about this product by Cectdigi, contact us by completing and submitting the form below. If you are looking for a specif part number, please include it with your message. Fast Wireless Charger,MEIWU Car Mount Air Vent Phone Holder Cradle for Samsung Galaxy Note 7/6/S8/S8 plus/S7/S6 Edge plus,QI Wireless Standard Charge for iPhone 8/8 plus/X etc.